EIA campaigners will be at the 36th Open-Ended Working Group (OEWG) of the Parties to the Montreal Protocol in Paris from Monday, July 20. At the 36th OEWG, Parties have four amendment proposals to consider for negotiating a deal on a global phase-down of hydrofluorocarbons (HFCs); HFCs are a group of potent greenhouse gases used mainly in refrigeration and air-conditioning, with climate impacts hundreds to thousands of times higher than CO2. HFC emissions are rising at alarming levels each year. If an ambitious amendment is agreed, more than 100 billion tonnes of carbon dioxide equivalent will be prevented from impacting on the Earth’s climate. 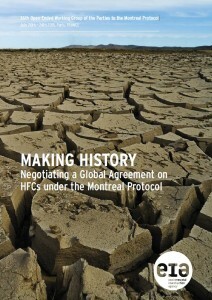 Ahead of the watershed 2015 Climate Change Summit in Paris this November, Parties to the Montreal Protocol have a unique window of opportunity to lead the global community in the fight against climate change by committing to a phase-down of climate-damaging HFCs. EIA campaigners have prepared the new report Making History, analysing the current amendment proposals for an HFC phase-down. The briefing calls on the Parties to form a contact group in Paris to begin negotiations on the text of an amendment to phase down consumption and production of HFCs to be adopted at the 27th Meeting of the Parties in Dubai this year.